ECE Adds HALT/HASS Chamber to Test Equipment! 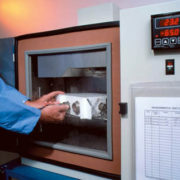 Electronic Concepts & Engineering, Inc. has acquired a Highly Accelerated Life Test / Highly Accelerated Stress Screening (HALT/HASS) chamber to expand our in-house testing capabilities. 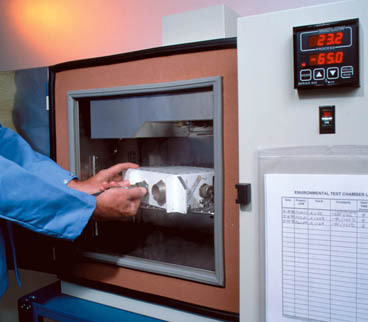 The HALT/HASS test chamber is capable of simultaneous all-axis vibration and rapid temperature changes. These “shake and bake” tests allow for strenuous qualification of our products, early identification of infant mortality, and refined system lifetime estimates. ECE has also added an Electro-Static Discharge (ESD) gun and a water immersion tank to our range of test equipment. The ESD gun allows validation and compliance testing of electronic systems to withstand ESD strikes of up to 30,000 volts. The immersion tank permits in-house submersion validation testing to depths of up to 2 meters. Expansion of our on-site product validation capability provides our customers with more flexibility and options. Just another way that Electronic Concepts & Engineering, Inc. makes the difference for our customers! https://www.eceinc.com/wp-content/uploads/rc_halt.jpg 322 368 admin https://www.eceinc.com/wp-content/uploads/ece-logo-revised.png admin2018-04-27 11:02:342018-04-27 11:02:34ECE Adds HALT/HASS Chamber to Test Equipment! ECE has Updated Their Quality System to ISO 9001 with AS9100! The State of Ohio Recognizes ECE with the Emerging Technology Award! ECE Presents Paper at SAE World Congress! ECE Now Registered to IPC J-STD-001! © Electronic Concepts & Engineering, Inc. Holland, Ohio. All Rights Reserved. Scholarship Created at University! ECE Now Registered to IPC J-STD-001!